Multi talented artist. I love 3D Origami Art, beatboxing, tattooing, scupting, making music, playing guitar, etc. I found out about 3D Origami from my father in law. He lives in Korea and taught me how to do 3D Origami. Then I bought a kit of the swan and from there I was hooked. 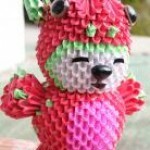 My favorite 3D Origami Artist is Mr. Park my father in law, David Foos and Jewellia7777. I always use glue for every piece and for a final coating on the whole piece.